This solar motion light just shines brighter due to the 24 powerful LED lights, which is far more brighter to provide security for your home or business accommodation. 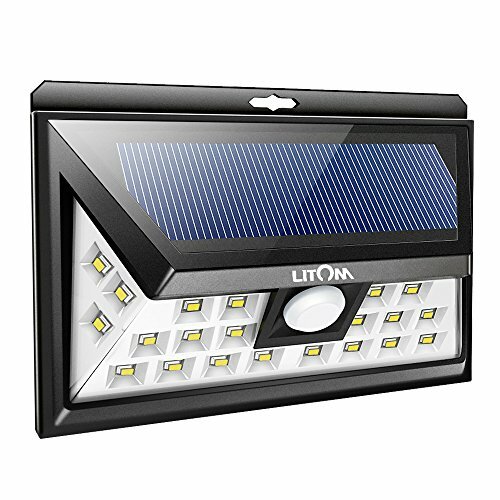 【World-leading Solar Light Brand】As the leader of the solar light industry, LITOM focuses on the innovation of design and technology to provide the best lighting experience to customer from all over the world. 【Brighter & Wider Lighting】Equipped with 24 upgraded high power LEDs and newest energy management chip, LITOM'S 24 LED solar powered light is the first light with wide range design in the world, which increases the angle and area of illumination by 50%. The illumination range of one light can reach 200 square feet and 800 square feet for 4 lights to be used simultaneously. 【All-Day Working Light】LITOM LED light absorbs and converts sunlight into electricity and stores in daytime and light up for 20 seconds when motion detected at night. It will prolong lighting time if motion detected once again during lighting, which meets your need to for all night use. 【Three Convenient Modes】 Compare with other single-mode solar lights, LITOM Solar Lights Outdoor bring 3 working modes to cope with different usage scenarios. Perfect for using on front door, back yard, garage, driveway, deck, pathway, and porch. 【24-Month-Long Life Span】LITOM Solar powered light is IP65 waterproof that it completely protects circuit and battery.